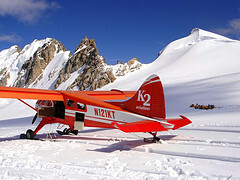 Talkeetna | Alaska Sightseeing Tours, Air Taxi Charter and Flightseeing Tours to Mt. 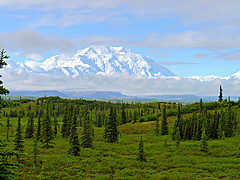 McKinley and Denali National Park. 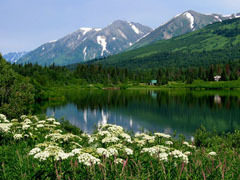 Alaska Railtours to Talkeetna from Anchorage and Fairbanks. Mt. 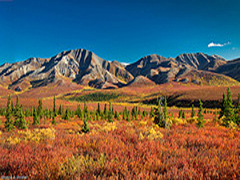 McKinley Flights and Glacier Landing, Mountaineering Base Camp Support, Individual Talkeetna Sightseeing Day Tours and Susitna River Jetboat Trips. This magnificent flight takes you within six miles of Mt. McKinley's summit. As your flight departs Talkeetna, you begin to see how the last ice age has shaped the land. Moments later you enter a world of rugged high mountain peaks and wide glacier filled valleys. Listen as your pilot describes the natural wonders of Denali National Park. See the Sheldon Amphitheater, beautiful Ruth Glacier, and the Great Gorge (the world's deepest - almost 2 miles from top to bottom). Land on a glacier beneath Mt. McKinley. You will talk about this tour forever! This flight will take you completely around Mt. McKinley. Begin with the McKinley Flyer route and see the south side of Mt. McKinley, including the Kahiltna Glacier, McKinley's famous west buttress, Sheldon Amphitheater, Ruth Glacier, and the Great Gorge. Then fly across the divide to see McKinley's incredible Wickersham Wall, a 14,000 ft continuous rise of rock and ice. Our passengers claim this flight is the highlight of their entire Alaska experience. Touch down for a landing at the Sheldon Amphitheater. Enjoy the stillness of the mountains broken only by the far off rumble of distant rock and ice slides. The glass-domed boats with onboard restroom are the most technologically advanced river jetboats operating in Alaska. You'll see the Chulitna Gorge and experience class 2/3 whitewater, visit an Dena'ina native camp with an authentic trappers cabin and enjoy a selection of hot beverages and cookies for a snack as you travel sixty miles on the Talkeetna, Chulitna and Susitna Rivers. Observe nestling bald eagles, beaver activities and moose. 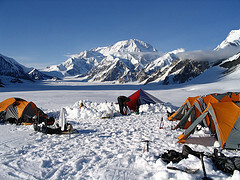 One highlight is of course the magnificent view of Denali and the mighty Alaska Range. Naturalists may enjoy wildflowers and plants that grow in abundance along the river system and you'll learn about edible plants that were used by native indians for medicines and cooking.